The new student dinner was a success. We had a good turnout, about 70 people, and we had a great time. This is a great chance for returning students and new students to meet each other over a great chinese dinner. 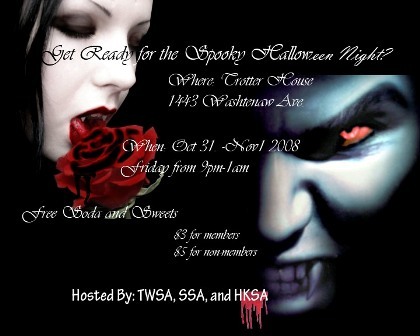 The entrance fee is $5 for members and an extra $10 to join HKSA, if you haven't joined us already. Hope summer has been the well deserved break you longed for since last september. It has been a great year, but it is now time to welcome this year's new wolverines. Below are the details for this year's reception. 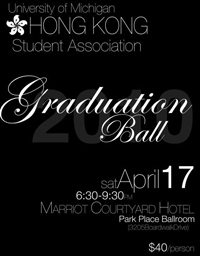 Please feel free to contact any member of the Graduation Ball Committee or any member of the Executive Committee of HKSA for ticket sales. 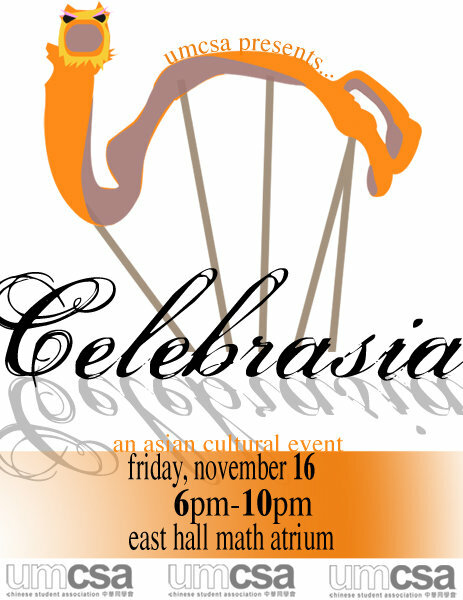 Please invite your friends and join us for a memorable night! Come join CSA, UAAO, and HKSA in this year's premier Lunar New Years celebration! Delicious Chinese food cooked up by Sheraton's own chef, awesome entertainment, and a dance to top it off. 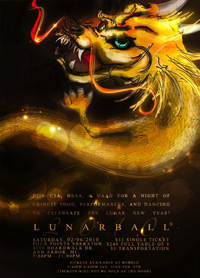 There's no better way to commemorate the Lunar New Year! $32 for a single ticket and $30 per ticket if you want to reserve a whole table for 8 people! Tickets will be on sale @ Bubble Island from 3-6 this Thursday and Friday before the long weekend and then 3-6 at Bubble Island from Jan. 19 until the Feb. 3! Tickets will not be sold at the door! Come see what our younger siblings at MSU can do! Just kidding, MSU! 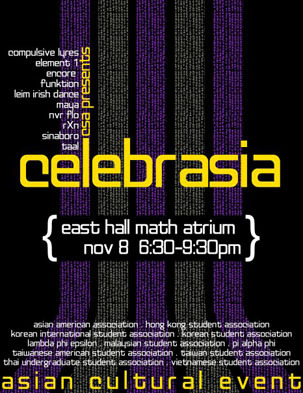 But seriously, CSC will be bringing two dance groups all the way from East Lansing to perform! The Hotpot + K-night was a great success. We would like to thank the support of our members and everyone who came to our event. Click here for pictures of this event. We know how cold and miserable winter in Michigan can get. 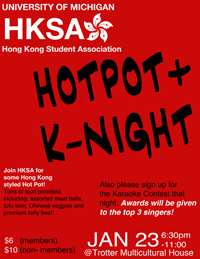 Hotpot night and K-night has been HKSA traditions for a lot of years. And now, we are combining these two into one event, which means double the fun! 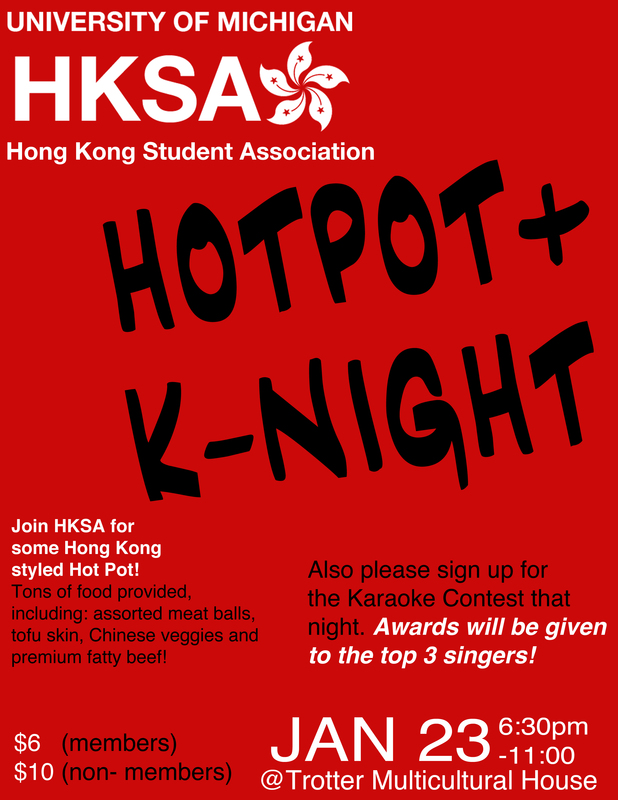 We are hosting the Hot Pot/ Karaoke night on the 1/23 (Saturday) at Trotter House. You will be served Hong Kong styled beef Hot Pot all night long to remind you just how great Winter in Hong Kong was. 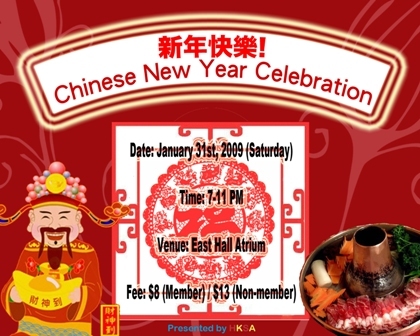 Tons of food will be provided and everyone will get an abundant share of assorted meat balls, tofu skin, Chinese vegetables and premium fatty beef! Further, everyone is also encouraged to sign up to sing in the Karaoke contest to lighten up the mood while we enjoy the chinese styled fondue. The winner will even receive a $20 gift card while two runner-ups will each be awarded a $10 gift card! 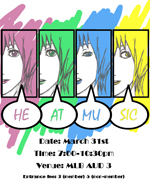 *****SEND the name and the artist of the song you want to sing with your name to hongkongc@umich.edu to register!! So please RSVP on Facebook. We can't wait to see you guys! 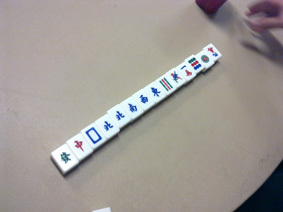 HKSA started this semester off with a blast at Trotter with a night of traditional Mahjong!! Click here for awesome pictures that capture the great atmosphere we created at the event. 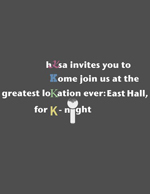 The HKSA is proudly presenting a new service for members to request for listings on our website. You are welcome to request a listing ranging from housing to book sales on HKSA website. Click here to learn more. The University of Michigan held the "Worldwide Club Day," an annual event sponsored by the Ross School of Business on October 31st at Grand Hyatt Hotel in Hong Kong. 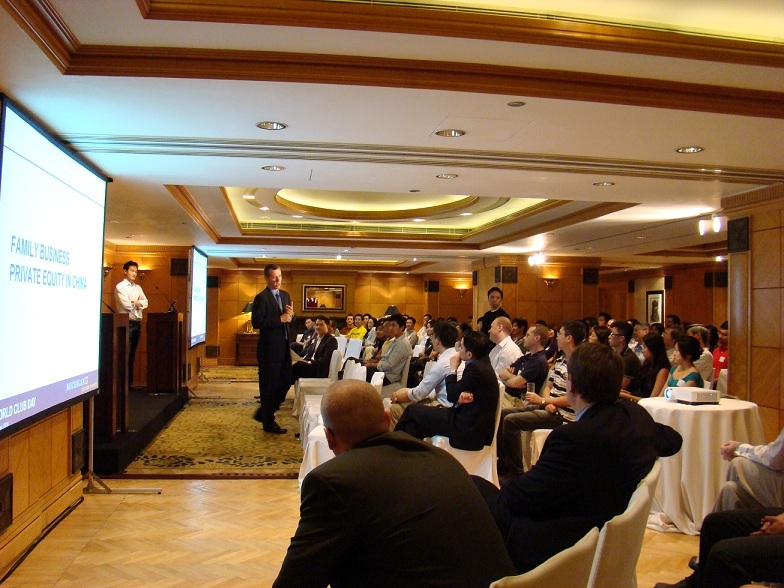 In this event, two senior Ross faculty members and one alumnus presented valuable information to the UM Hong Kong alumni. 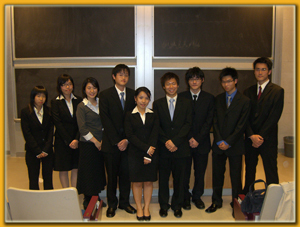 Click here for the general information of the subdivisions of UM Hong Kong Alumnni Association. John Copeland, Director of Strategic Planning of Ross School, presented the latest developments of Ross, in particular the brand new US$100 million state-of-the-art school building Also, Len Middleton, a core faculty member of Strategy & Entrepreneurial Studies at Ross School, joined the Hong Kong alumni that day. Professor Middleton is no stranger to Hong Kong since he teaches regularly at the executive education program in Hong Kong. Professor Middleton is very active outside the classroom; he is a driving force behind Ross' private equity investment activities, MAP programs, and the new partnership with Shui On Land's corporate university in Shanghai. Click here for the two Professors' PowerPoint presentation. Lastly, Medes Ma '95, who has worked in numerous Asian financial centers, presented his first-hand experience in recent financial cycles and economic trends in Asia. Click here for Medes' PowerPoint presentation. 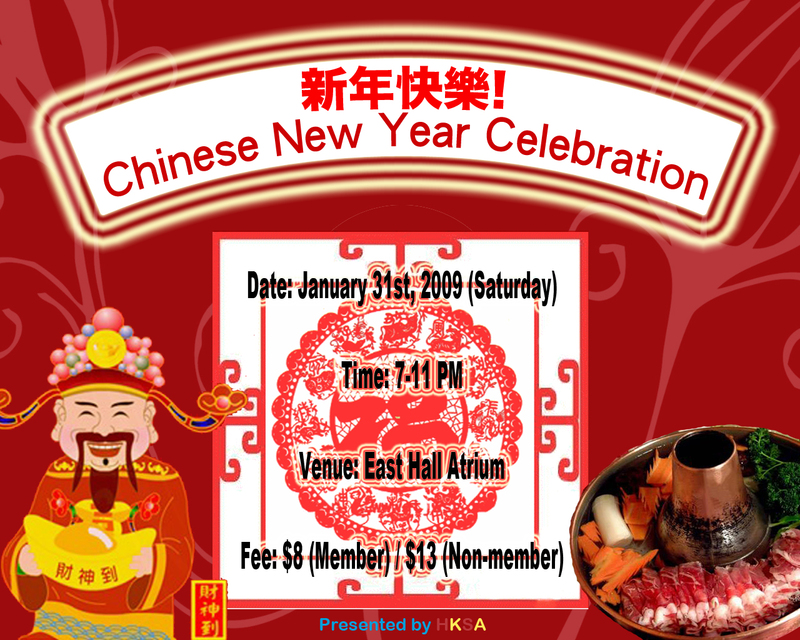 In addition, to join the HKSA as a member, please bring $10 membership fee on Saturday. Come meet the new students and get acquainted with one another ! See the facebook event information page here. Sign up to perform individually or as a group now! The best two performers or performing groups (decided by votes) will get autographed photos of Jackie Chan (成龍) and Andy Lau (劉德華). If you wish to perform, please sign up by emailing our Communications Director Norman Lam: lamnk@umich.edu by 24th March, 2009 (Tuesday). We hope that you can contact us as soon as possible so that we can provide any necessary assistance. There will also be a lucky draw for the audience. The prizes are autographed photos of Stephy Tang (鄧麗欣) and Daniel Wu (吳彥祖). 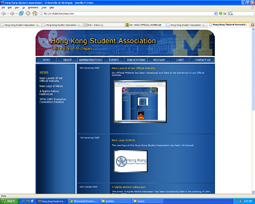 The website by the Graduation Committee for HKSA Class of 2009 is available here. Please contact Ronald Leung or Ann Wong for any questions concerning the details of the Graduation Dinner and the Commencement Ceremony. 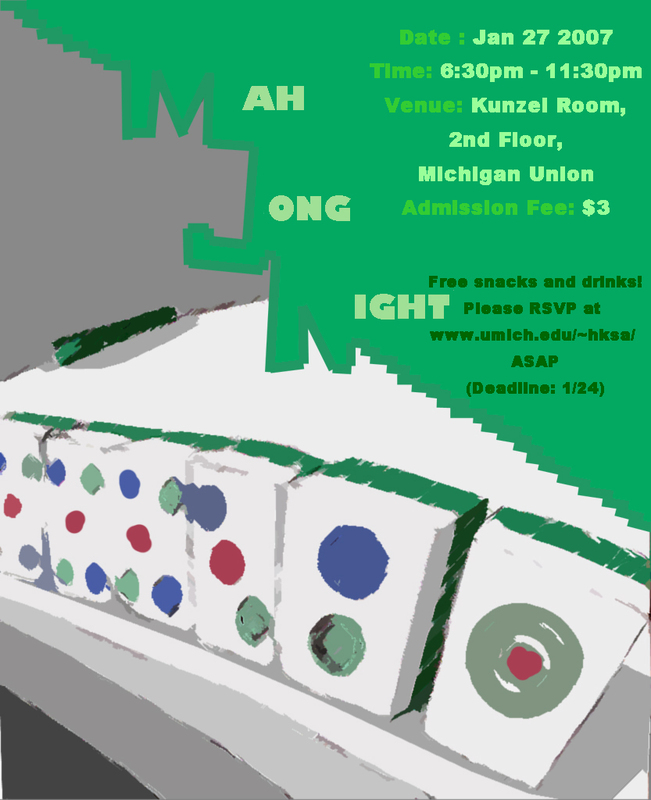 Guangdong Mahjong rules apply. Refreshments will be provided. UM HKSA had successfully co-hosted a party at Armani Bar HK on New Year's Eve. The Facebook event page for this party is available here. After such a memorable night to start off 2009, we will be looking forward to work again with the wonderful hosts from IC, UCL and KCL in the future. 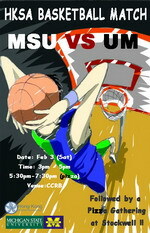 Please check this site for other upcoming events by UM HKSA. 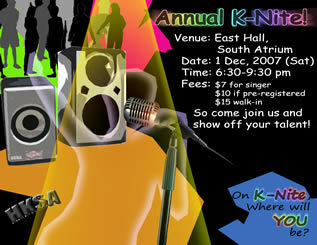 K-night 2008 was successfully held yesterday with a great turnout. The HKSA Exco members would like to thank everyone for their support yesterday, and will be looking forward to seeing you all again in our future events. To purchase tickets, please come to the HKSA booth at "Wassup China", a free-of-charge event hosted by ACED (Association for Chinese Economic Development) on November 21 (Friday) from 4 -7 PM at the East Hall Atrium (Psychology side). If you are not available to come to "Wassup China", please approach any of our executive committee members directly for tickets. 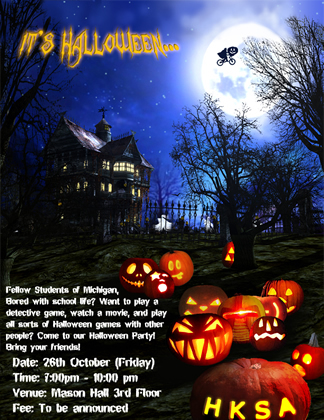 email us at: hongkongc@umich.edu if you have any further questions! 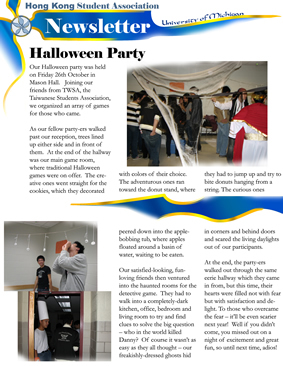 The Newsletter for this year has been posted. Click here to view it. Click here to register for airport pickup if you want a ride to campus on the day you arrive in Ann Arbor. *Welcome all graduates and non-graduates! Cocktail party will start at 6:30pm. Dinner will be served at 7:30pm. -Guests are responsible for any additional drinks at the cash bar. 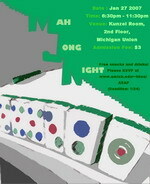 -Please send an email to kinchun@umich.edu if you cannot come and buy tickets during the hours of ticket sales. -Reservation must be made by Apr 1 (Tue) for final counts of entrees to the hotel. 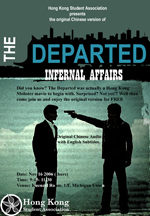 Please come and say goodbye to over 30 graduates of this semester! The Heat Music is coming soon. The details are as follows. Both performers and audience admission registration are done on the same page. 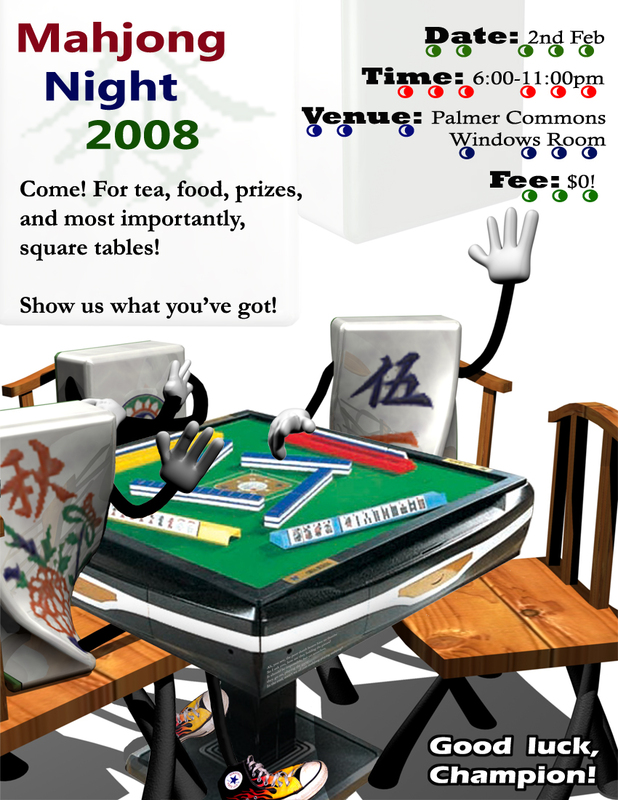 Mahjong Night 08 will be held on the 2nd of February. 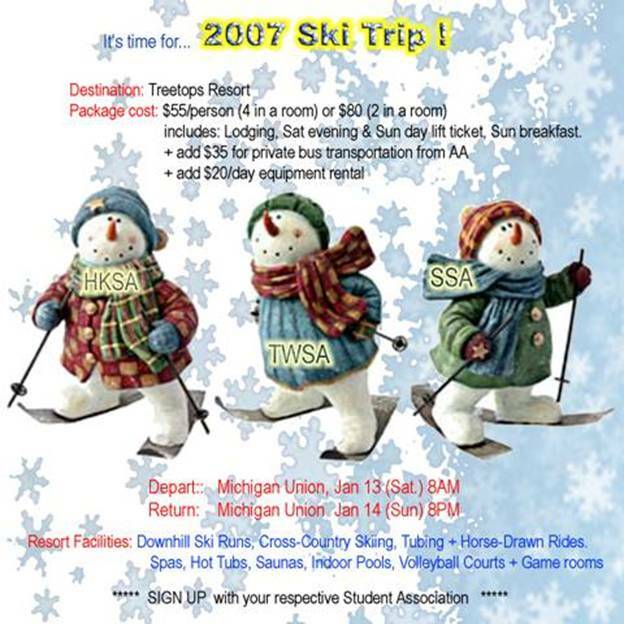 Hello everybody, the Ski-trip this year will be held during MLK weekend. Here's are some friendly reminders. K-night was a big success once again with many competitors as well as audience. Well done everybody! 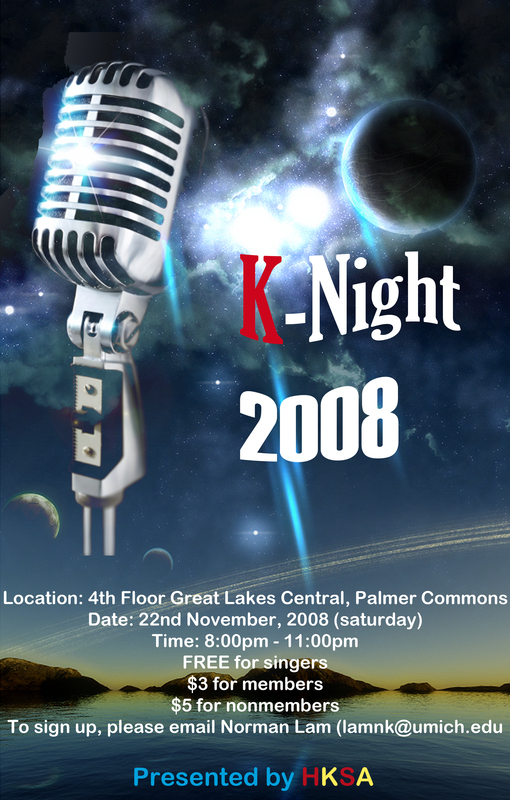 K-night 2007 is here! 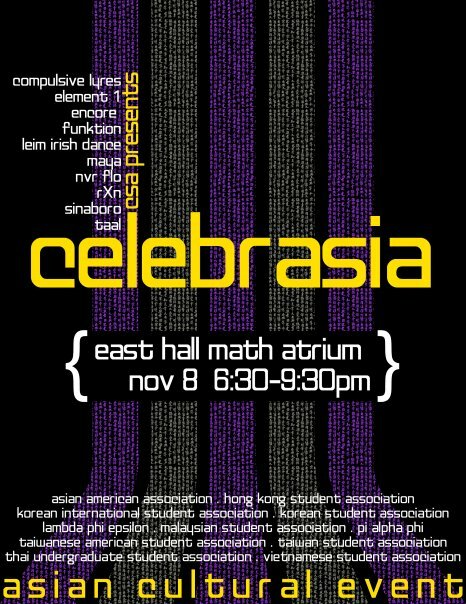 It will be held in East Hall South Atrium from 6:30-9:30pm this SATURDAY! 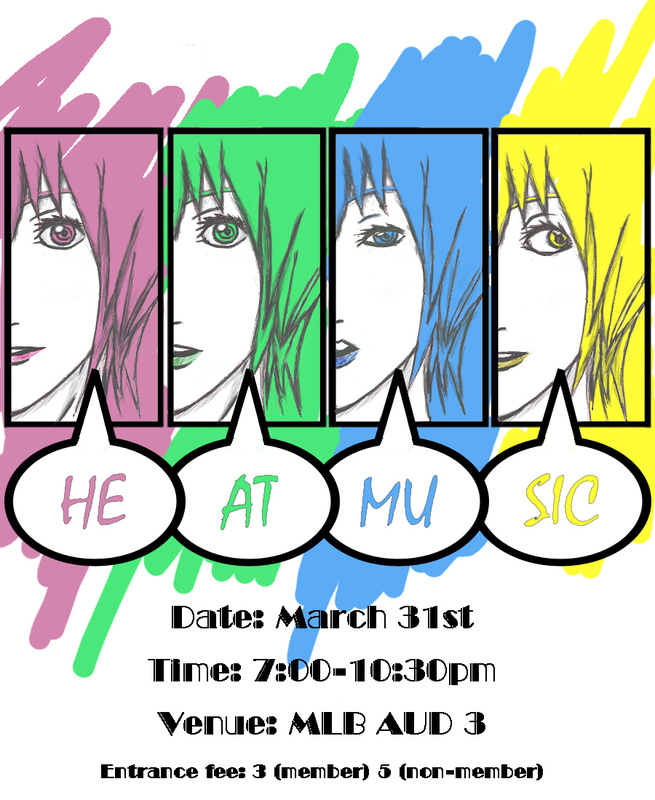 So register NOW if you want to be an audience or show off your singing skills. Comment box is now up and running, go to "CONTACT US"
To register to be a candidate, please click the following link. List of candidates will be published after the deadline of registration. Deadline: 25th September 2007 (Tuesday) 11:59 p.m.
To register, please click the following links. If you want to leave some words for us or receive a hardcopy of our newsletter, please follow the link below to register. 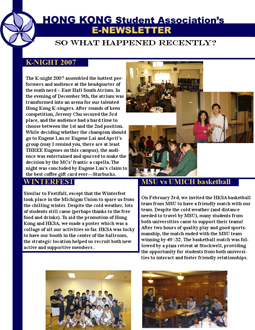 20th March 2007 2nd Newsletter Available! The 2nd Issue of our Newsletter is now available on the 'PUBLICATIONS' tab. The Heat Music is coming soon. It will be held at the end of this month. The details are as follows. 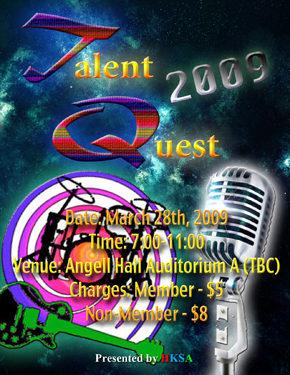 Both performers and audience admission registration are done on the same page. For details, please refer to the following pdf file. 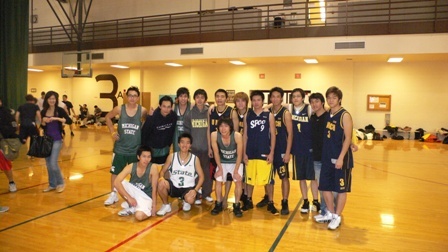 The HKSA Basketball Team of MSU visited us during the last weekend! This event was followed by a Pizza Gathering at Stockwell from 5:30pm to 7:30pm. 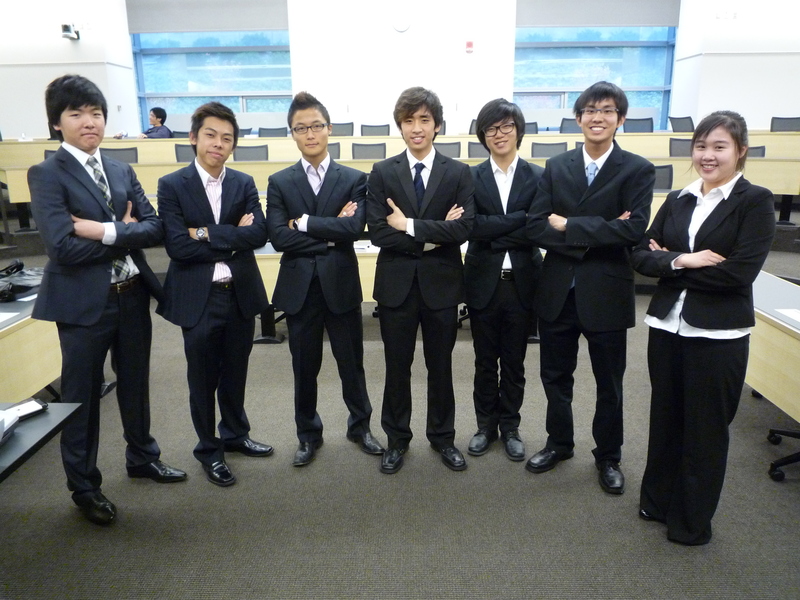 In order to facilitate communications among HK graduates in the future, a email group hkgrad07@umich.edu is now created and is accepting subscriptions now. To subscribe for the email group, please check the following link. 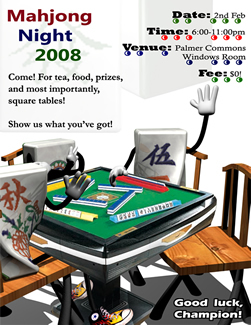 The Mahjong Night was held on the 27th of January. [ Further details are available here ]. 7th January 2007 Galleries Available ! 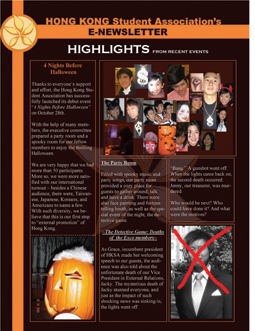 The reports and galleries of our 4 previous events, K-Night, Basketball Quadrangular, Movie Night and '4 Nights before Halloween', are now available on the 'EVENTS' tab. The K-night 2006 took place last week with an attendance of around 50 members. 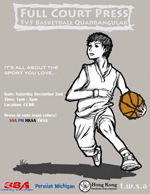 A basketball quadrangular took place on the 2nd of December (Saturday). 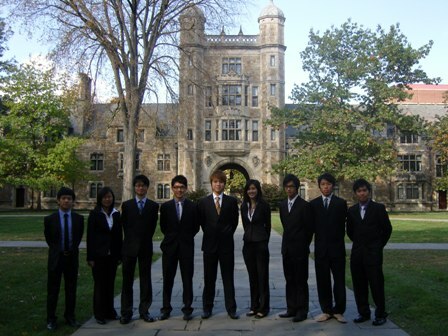 The participating teams include Singapore Students Association, Permias Michigan (Indonesian), Taiwan Student Association and Hong Kong Student Association. Our Official Website has been redesigned and here is the new layout of our Official Website. The first issue of the E-Newsletter is now available on the 'Publications' tab. 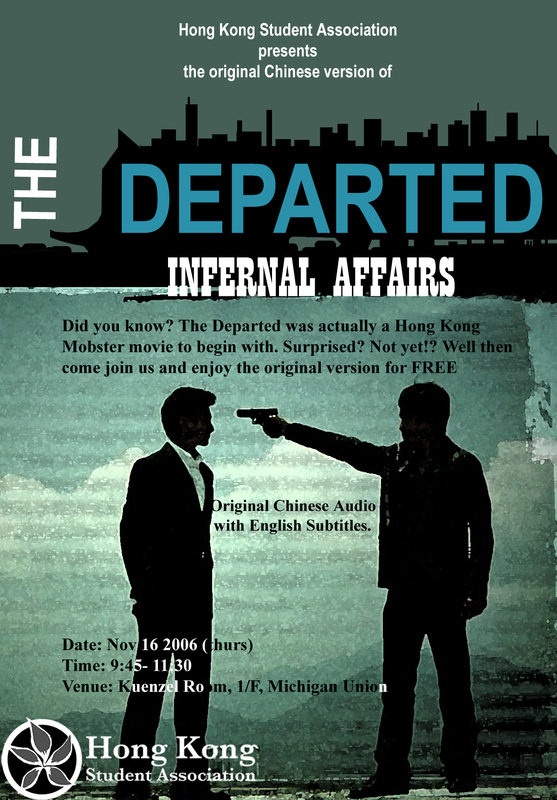 As 'The Departed' hit the States, so did its original Hong Kong version! 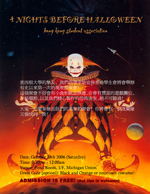 HKSA presented Infernal Affairs in the Michigan Union which housed nearly 100 guests on 16th November. 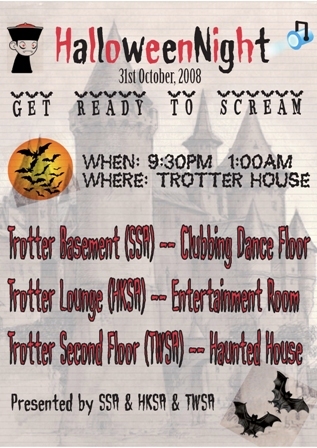 The event '4 Nights Before Halloween' has been successfully held in the evening of 28th October 2006.